In this Chester Drum adventure, Drum is hired by “the Governor” to find his adult son, who has gone missing in Spain. As the search gets underway, Drum is put off by the lifestyle of American expatriates living on the Costa Del Sol, and wonders if the missing son has simply melted into this live-for-today group. As he digs deeper, however, he uncovers widespread smuggling. It’s used as a form of investment: give some money to an “agent” to invest with a smuggler, get your dividend which is a share of the profits of the shipment. He also discovers the missing man’s beautiful daughter, who is in love with a local bull fighter, is involved up to her pretty neck and seems to know a lot more than she’s admitting. With few clues to follow, in true hardboiled P.I. fashion Drum has to poke his nose in wherever he can to sniff out motive and try to figure out where the missing man may have gone—and whether he is alive or dead. This is an entertaining P.I. novel, and the setting, typically of Drum novels set around the world, provides a nice change from big-city grit. Though I suspect this isn’t the best of the series, I like the character of Drum and Marlowe’s writing. at her own blog, and posts a complete list of participating blogs. This sounds good, Richard. I had not heard of the author or the book, but I will certainly see if I can find this or others by him. I think you’ll enjoy a Chester Drum novel when you read one, Tracy. Many moons ago, while in high school, I far preferred Richard S. Prather to Stephen Marlowe. Now the situation is reversed and I like Marlowe better than Prather. Maturity or dotage? You decide. I still prefer Prather, though I prefer “Brett Halliday’s” Mike Shayne over both of them, I think. But this was a good Drum. I’m a big fan of Stephen Marlowe. 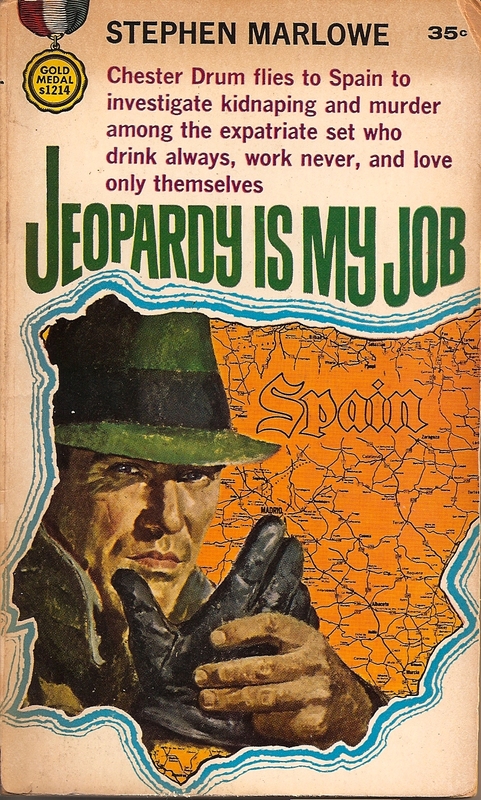 The Chester Drum series differentiated itself from most of the private eye novels of the 1960s by giving the books an international dimension. You’re right, George, Drum’s travels are an important element in the series. I’m a Marlowe fan, and my big thrill at the Monterey Bouchercon was getting to sit beside him at the signing table and talk to him a while. Cool. If I’m not mistaken, he was somewhat of a character. What Jerry said. I used to prefer Prather too. I wish I’d read more of these in the ’60s. I like the travelogue aspect of several of these paperback series of the era – Philip Atlee, Edward S. Aarons, etc. I still like Prather, though I haven’t read one in a while. I see a number of these are available on Kindle for 99 cents each. Good to know. Thanks, Jeff. Like that cover. this is not one I’ve seen. Matt, worth taking a shot. I don’t think you can go wrong reading any of the Chester Drum books. To double your pleasure, though, let me recommend DOUBLE IN TROUBLE, a 1959 paperback from Gold Medal featuring both Shell Scott and Chester Drum. Steve, I have it on the shelf, but haven’t read it (yet). Thanks for the reminder.